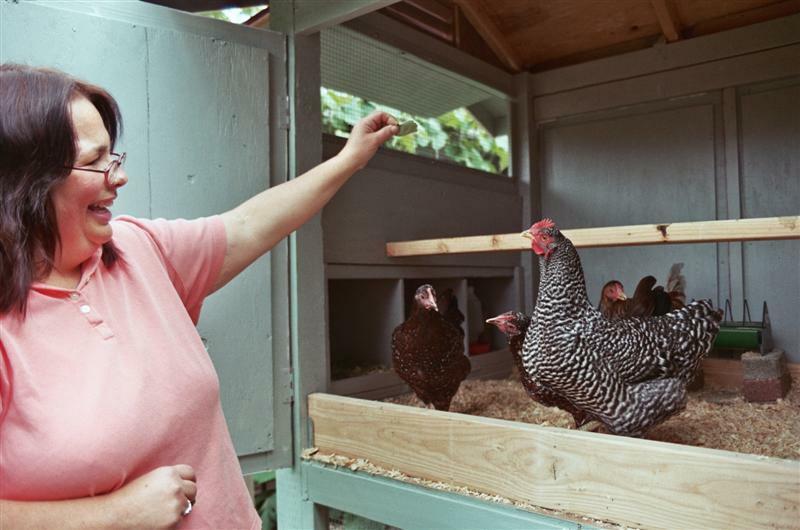 We went to a garden show one day and saw a few entries that had chickens and their adorable and seemingly quite comfortable (if you're a chicken) backyard coops. They had all sorts of information why having chickens is beneficial for the environment and a great source for fresh, healthy eggs as well plenty of "chicken TV" entertainment. After much thought we decided we would like to have some chickens in our yard. 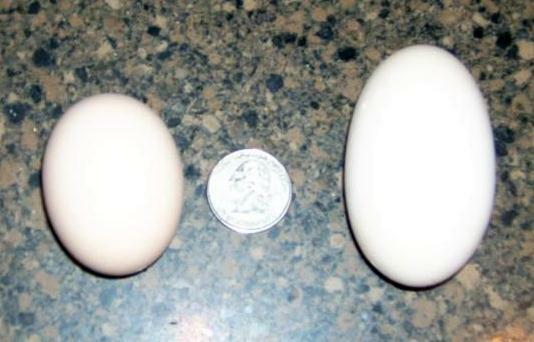 I spent an entire year reading books, going to classes and surfing the Internet gaining as much "chicken knowledge" I could before getting our lovely little chicks so we would be well prepared. During my research I came upon the BYC Forum and saw all the wonderful ideas here! 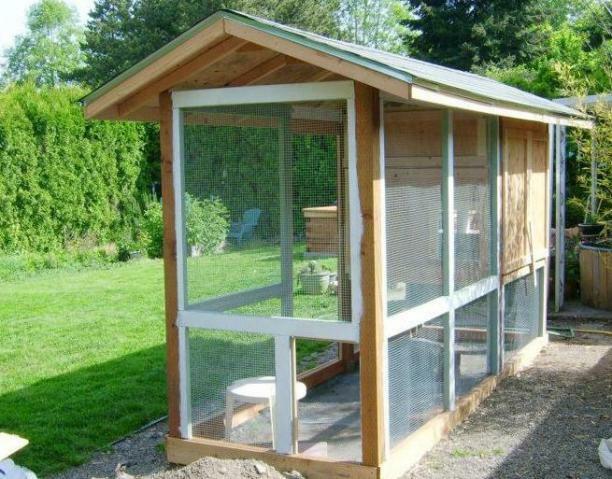 I took some of those ideas along with others I came upon and added a few of my own to create our very own coop. 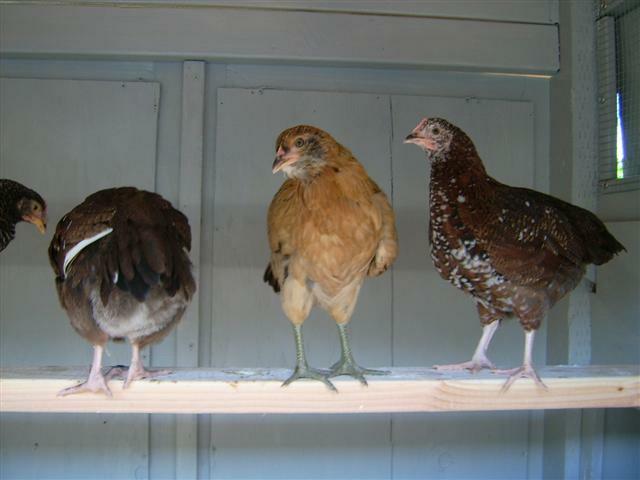 We pre-ordered our chicks and picked them up as soon as the coop was framed. 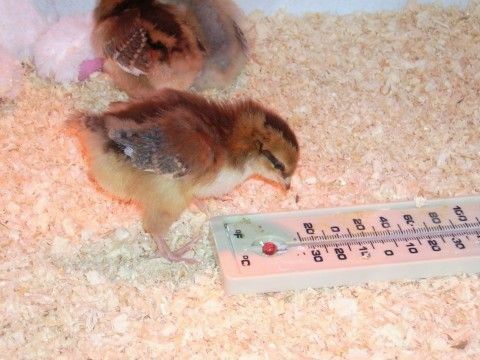 Here is Poppy checking the temperature--she is still very picky, LOL. 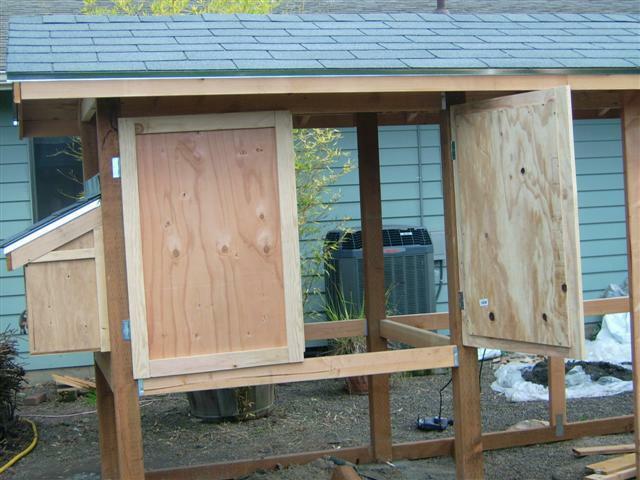 A permanent run and hen house for our girls. Completely predator safe so the girls could go in and out of the henhouse freely 24/7. Comfortable and roomy for the girls. Be able to get up close and personal with the girls to be able to check for lice, mites or illnesses. Use quality wood and screws for strength and longevity. 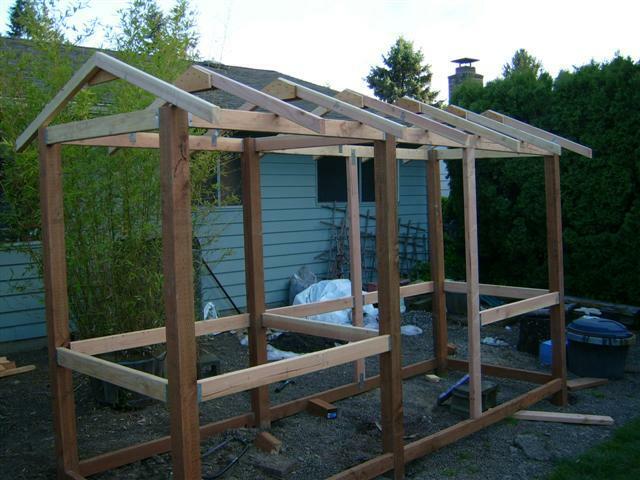 We chose to have 5 hens so I wanted 5' x 12' but due to the normal lengths of the wood my husband felt it would be less waste and take fewer cuts in the wood to make it 4x13--the henhouse 5x4 and run 8x4. He actually doesn't build things often but jumped right into this project as he wanted chickens as much as I did. 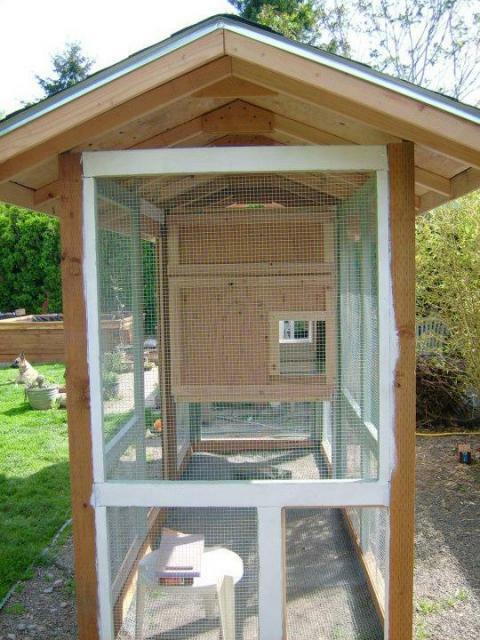 I also wanted a raised hen house that I would be able to reach across easily. I am 4'11" so 4 foot wide made more sense. 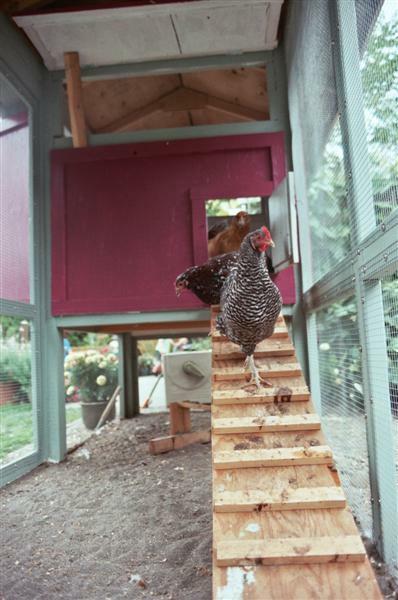 We decided to raise the henhouse floor 32" to make cleaning really easy on our old backs. Coop next to our patio Our girls coming out to say "hello." These were the original plans I drew (you can see I am not anything close to an architect). You'll notice that we made some changes as we went along. One major change was to put the "human" door right next to the henhouse. We chose to build it about 15' away from our house next to our patio so we could see the girls from our house windows, care for them and collect eggs in any weather. 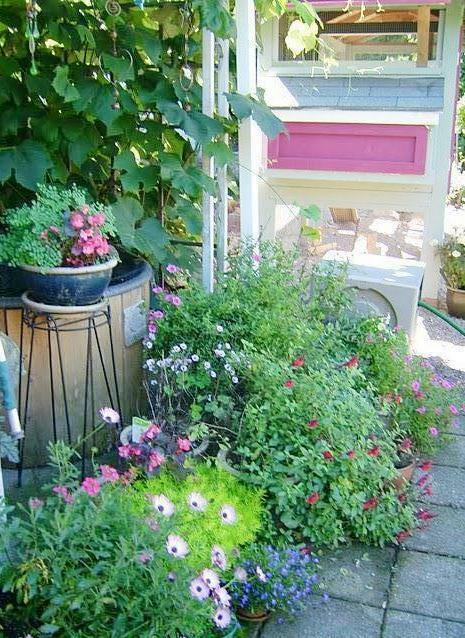 We have clay soil but we added several inches of pea gravel years ago so it doesn't get muddy. Our yard also has a natural slope that prevents flooding during our rainy winters (we live in Oregon). My husband built a 13' x 4' frame along the bottom after he sank 6 4x4s nearly 2' using a post digger and backfilled with gravel. He put 1/2" hardware cloth under the entire coop for protection and 2x6 boards along the bottom to form a "box" so we could fill it with 6" of sand. 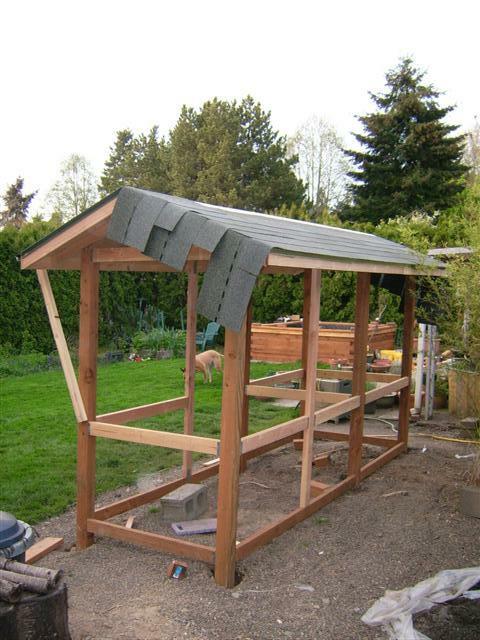 My husband framed the coop and roof with 2x4's and used plywood to cover the roof. He then covered with roofing shingles to match our home. We filled the "box" all the way to the top with sand as we knew there would be some settling and the girls would kick some out. 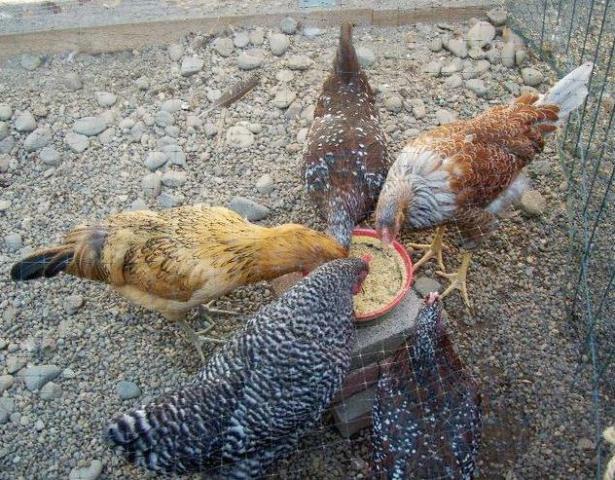 Its been 7 months since they've been in their coop and there has definetly been some loss of sand--enough that we may toss some back in or add a few bags of sand this spring. 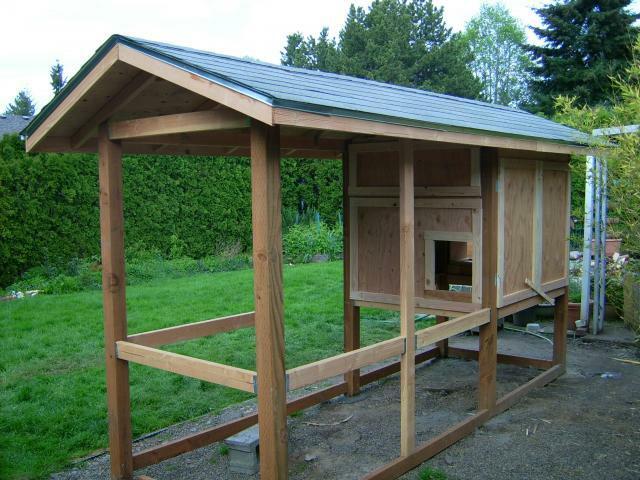 The henhouse is 5x4' and after being framed with 2x4s he used plywood for the walls and floor. The floor was covered with vinyl which works great for cleaning the shavings out! 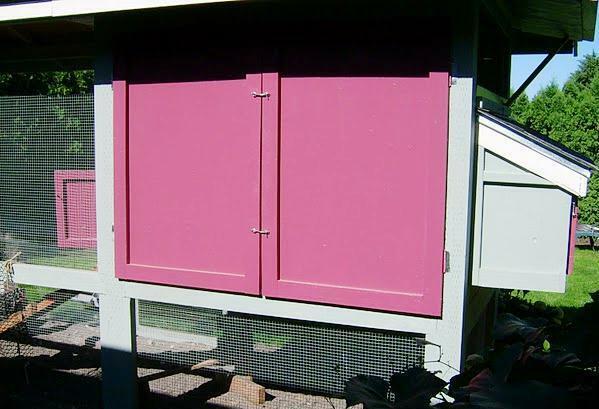 We made double doors on both sides that open almost the entire length of the hen house for ease of feeding and care. I wanted to be able to reach everywhere simply and easily. I would definetly recommend this! Our pop door is 14"x12" with a 3" lip to keep shavings in the house, LOL. We also added a ladder so they could go down to the run safely. The pop door is always open but we have a door attached to close it if necessary. It has a hook that attaches to the hardware cloth to prevent closing accidentally. 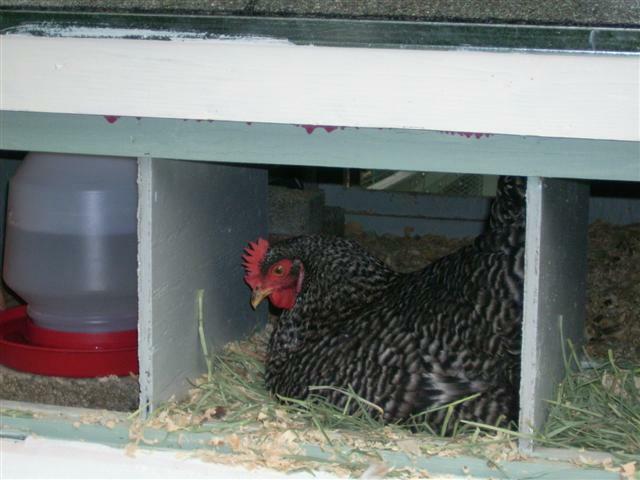 We added an external nest box so we could collect eggs easily and allow more indoor room for the girls. We decided to use all of the space so we made 3 nests for them (almost 14" square) and use one for a 1 gallon waterer which they love as we have a large plastic trough for their food in the house. We made the roof of the nestbox permanent (also shingled!) and the front of the nest box to open downwards (the rose color door). This not only allows me to gently push a hen off the nest or check under her if she is sitting but keeps rain out of the box! There is a childproof lock on either side. We have magnets on the nest box door and the fixed box so it closes tighlty in the winter to keep them warm while they lay their egg. To allow more air circulation in the summer we put a small "door stop" between the door and the fixed nest box and it stays open 1/4" to keep them from gettng too hot. 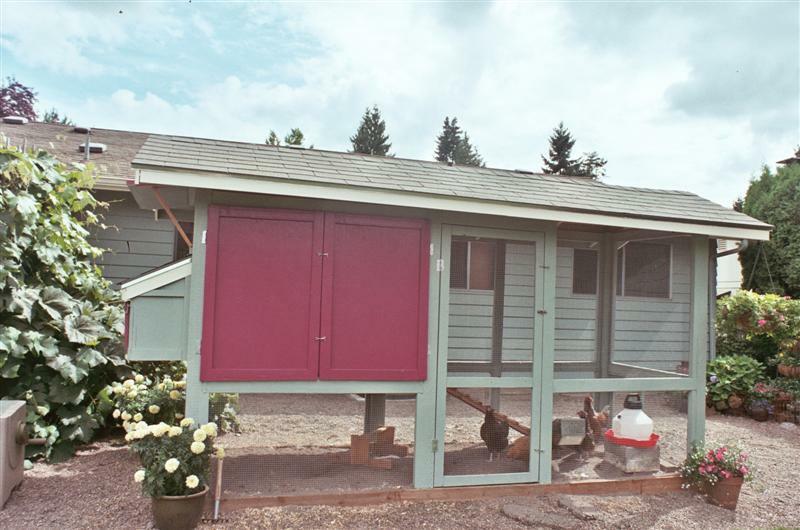 We painted the coop in our house colors --Glen Ivy Green and English Rose. 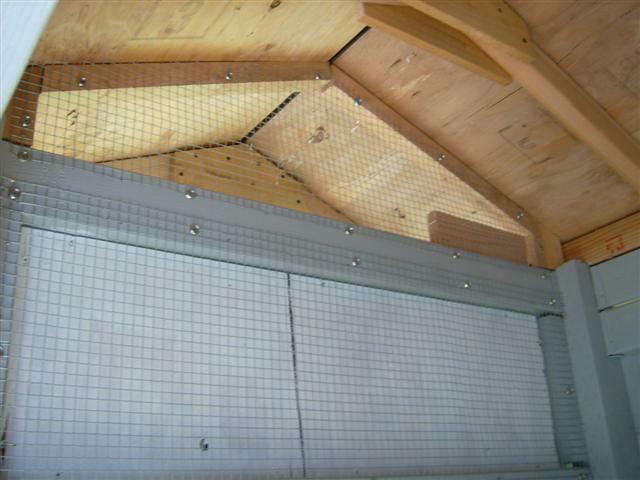 Inside the hen house we made a large ventilation opening facing the covered run to be left open all the time. We have since added a piece of plywood to reduce it to 1/2 size as it's colder in winter and we'll remove the plywood in the spring. We placed a slatted vent opposite it for a good air flow. Under the ventilation areas are windows that open for the summer. Since we usually leave the pop door open they have plenty of fresh air flow without a direct draft. All spaces larger than 1/2" are covered in hardware cloth--used washers and screws for more security! 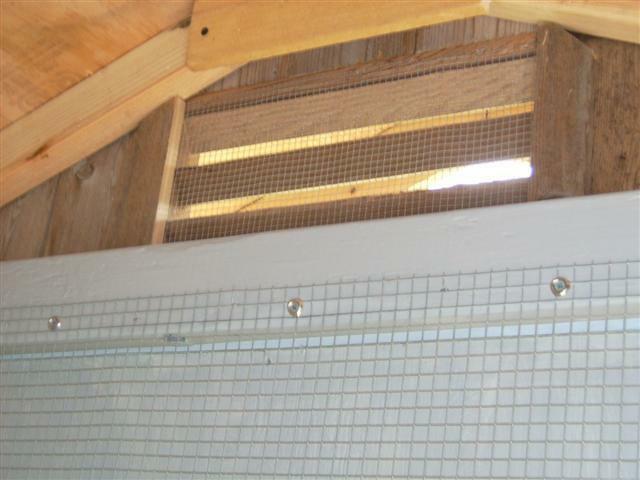 We did add hardware cloth over the larger ventialtion area to keep the girls from roosting on it and leaving a poopy mess. As you can see in the above picture we put a 2x6 board on both sides next to the hen house doors to keep the shavings from falling out when we opened them. 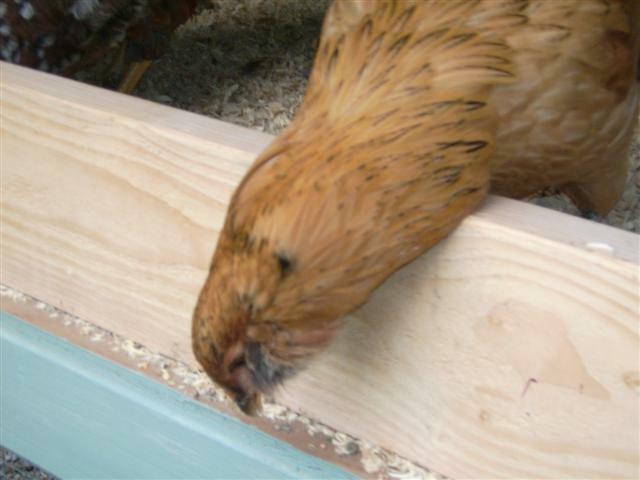 We put the board in slats so I could just lift them out to clean the henhouse easily. We put a roost made from a 2x4 wide side up and sanded the edges for their comfort. We slid it into metal slats for easy removal to clean. 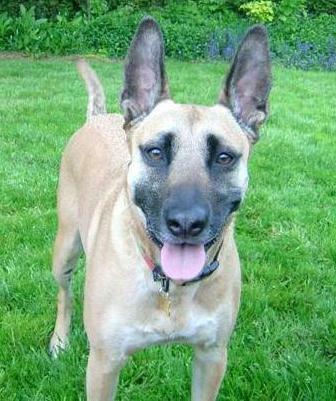 It is only 18" from the floor which makes it easier on their feet and their livers when they jump down. I must have read too many bumblefoot and hemorragic liver stories, LOL. Ready for bed in the summer! 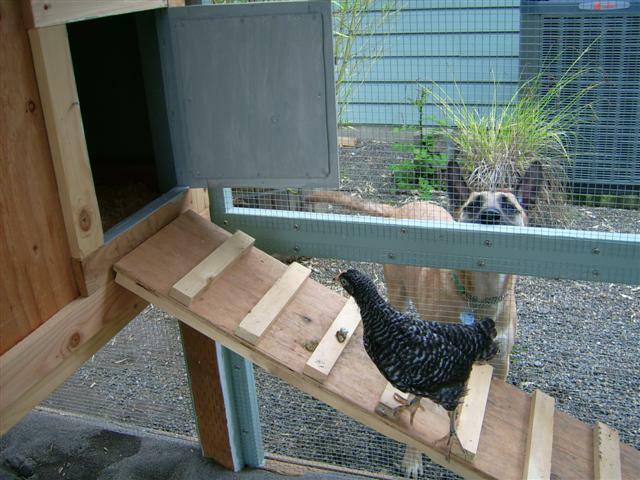 We can go out to play through our coop "chicken" door! We used all child proof locks and always two on each door except for the "people door" which has 3--2 hook childproof ones and a slip bolt in the middle. 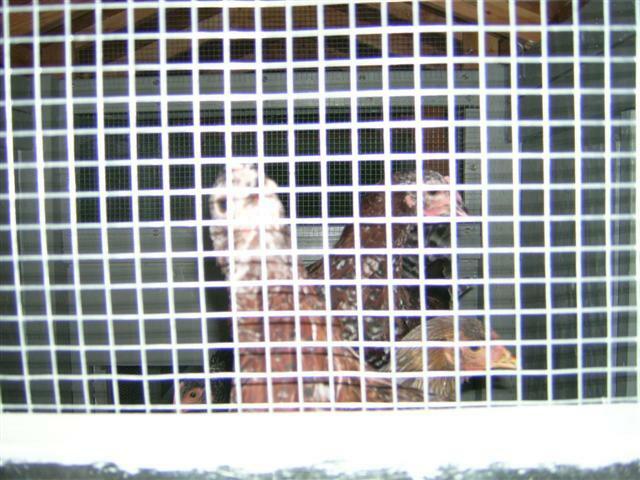 The other is their extra chicken door on the end of the coop (you can see it in upper photos) with only 1--we open to let them out of the coop. We also added a plastic fenced area off that extra door (netting over it for raptor control) when we are home but not in the yard with them. One of us is home most of the time due to our work schedules. My husband did a wonderful job--especially with me telling him what I want and he had to come up with a way to do it. Thanks, Honey!! Doors that open all the way on both sides of the henhouse. Saves a ton of time as everything is within reach. 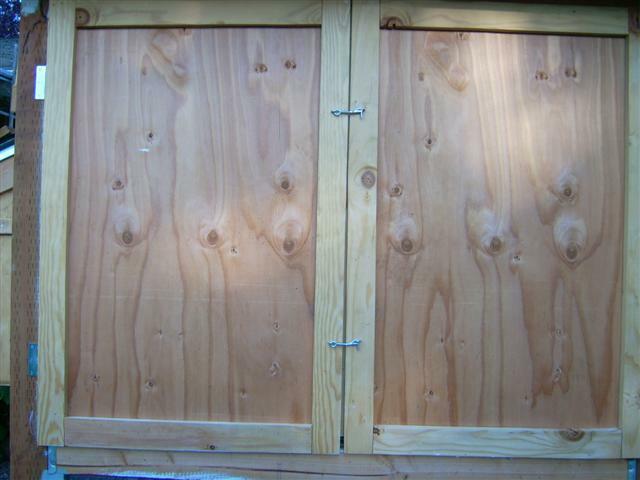 Slatted boards to hold shavings in and a lip for the pop door. A must have in this type of set up. Vinyl flooring. Soooo easy to clean!! Having the henhouse floor 32" off the ground. A real back saver! It's also fun when they run up the ramp to be practically in your face wanting some affection. 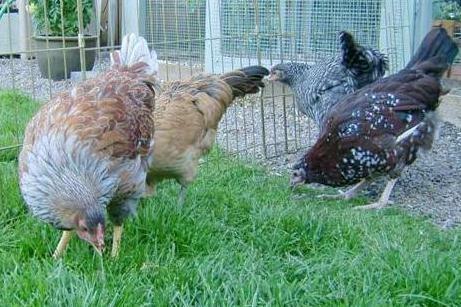 You can pick them up easily to check for mites and whatever and not have to bend down. It allows the girls plenty of useful room under it as well. 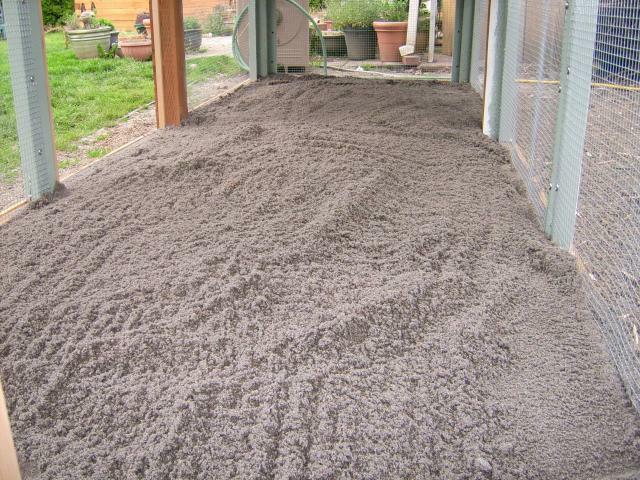 Add another 2 feet of pea gravel near the grassy side of the coop to prevent muddy grass from the rainfall off the roof (we don't have a gutter). We will be adding this in the spring as we ran out of time before the rain started this winter. 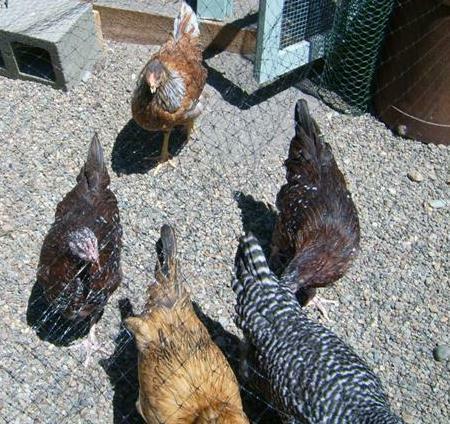 Our happy ladies, Hyacinth, Beatrice, Agnes, Poppy and Pearl. Can't you see I'm busy???? You did an excellent job with your narrative and the pictures as well. I like how you gave it a review yourself, as far as what you liked and what you would change. this is an appealing, well considered coop. The article does a great job of explaining each design and construction decision. 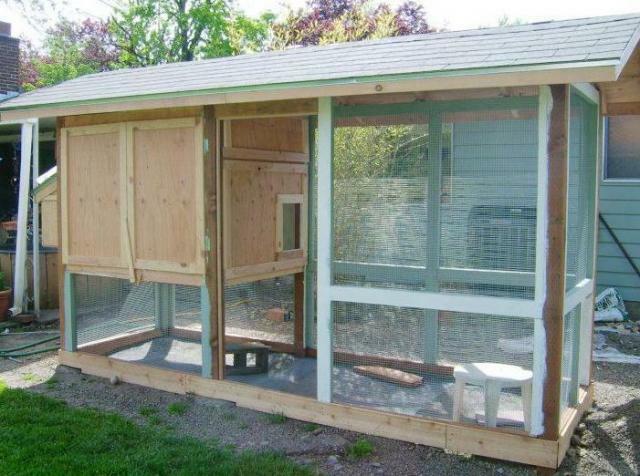 Very Nice coop. I love the way it was made to keep it clean! 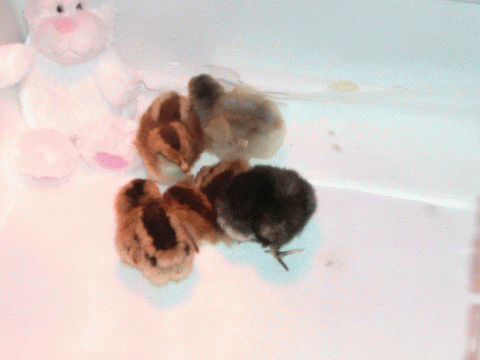 we made our coop but it is not easy to clean. Very nice job ! Looks great. 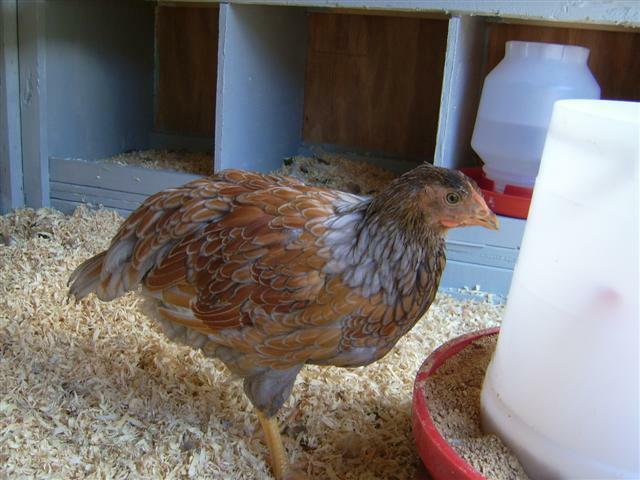 How is the sand working for you in the run - i'm planning our 1st flock (The Spice Girls) and am very interested in sand for their run (area outside the ramp up) and i'm planning on sand in their coop (under roost ) . Thanks. Hi. My husband said he stopped adding the cost after awhile as he really was afraid to know how much it cost--ha ha! We used mostly new quality materials but had some roofing tiles left form our home so my hubby guessed $900--1000. We've had it 2 years now and still LOVE IT! It is incredibly easy to clean and our hens are very happy with the set up too. I love this coop!!!! This is what I want!! 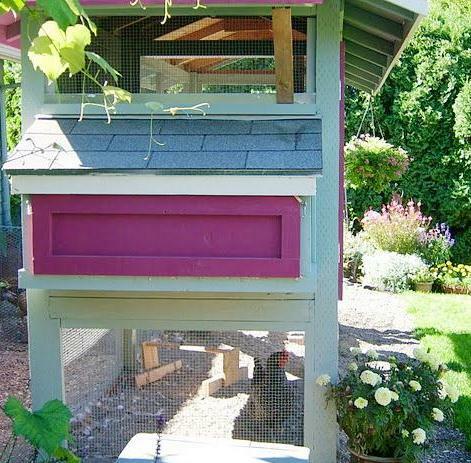 Would it be too much trouble to tell me how much you ended up spending to build your beautiful coop?